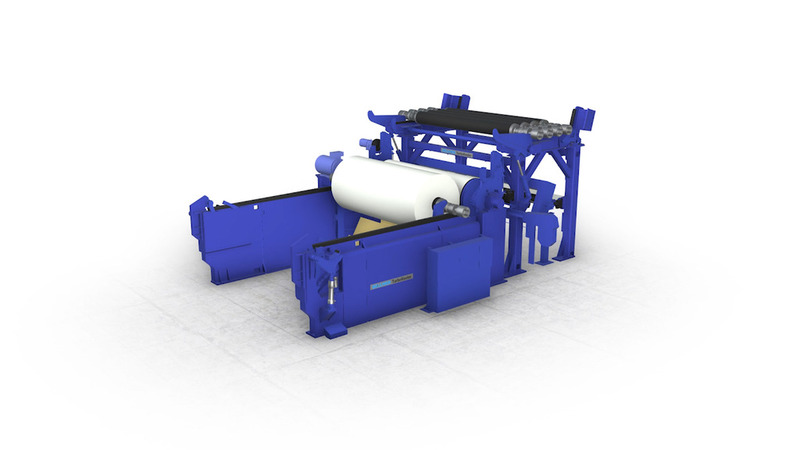 The Bellmer TurboReeler is a high-class conventional Reeler in its perfected form for your paper machine. Thus, the TurboReeler ensures perfect reeling quality on any paper grade from Pulp, paper, board, specialty paper. Large reeling diameters up above 4m jumbo reels are wound 24h/365d. Full automation concepts including Jumbo reel transport via Transporter to the winder are available. Our specialists design, customize and manufacture in Germany our TurboReeler and the full final group section concepts. Subject to the case of application, our experts adapt the Reeler ideally to your range of grades. The experience of more than 150 TurboReelers around the world allows top performance on any grade. Our reeler guarantees safe, repetitive and reliable reeling results with high level of automation. Furthermore, reeling hardness control from core to maximum diameter are monitored and controlled. To minimize change over broke, we install air type, belt type or water cut change over devices. For sensitive papers, we provide different reeling drum covers or upgrade the reeler with a secondary drive to a TurboReeler Pro. For sensitive paper or paper with low air permeability, we can provide you with the TURBOReeler Pro featuring a secondary center drive. This will ensure that the secondary reeling build-up can be performed in a sensitive way, equipped with the corresponding drive technology. Especially sensitive papers such as thermo papers need a special treatment. One inadequate reeling cycle and this top quality paper becomes broke. Our TURBOCenterWinder perfectly masters this highest demand on reeling and its extreme sensitivity. Through its unique design, each paper roll is reeled up with just one center drive from the starting core up to the end. There is no transfer within the reel, no matter if the reeling process is effected via reel spools or core shafts. The easy way to decide for a TurboReeler is to award Bellmer with the complete final section package. Secure installation of the Reeler with threading and broke handling pulper are an integral part of the project. Expect intuitive controls to ensure permanent adjustment of the necessary reeling hardness. Anticipate excellent startup and great runability. Our specialists are looking forward to taking on also your challenge. Get further information and your personal presentation of our reeling section solutions for your production line.